Hair is removed from Front and back of shoulders. Hair is removed from the entire arm, including hands. Hair is removed from the entire underarm region. Hair is removed from above the stomach to the shoulders. Hair is removed from the entire midsection. Hair is removed from the upper half or lower half of back. Hair is removed from the entire back not including shoulders. Hair is removed from the entire back, including front and back of shoulders. Hair is removed from the buttocks cheeks. Hair is removed from either the top or bottom half of the leg. Hair is removed from the both legs, including feet. A Basic Bikini wax with a Full Legs wax. Unwanted hair around the eyebrows is cleaned up. Reshaping and thinning is not included. 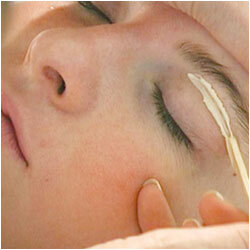 If you desire a new look for your eyebrows, and have never had them waxed. Think eyebrow makeover. Hair is removed from the top and/or the inside of the nose. Hair is removed from the outside of the ears. Hair is removed from the sides of the face. Hair is removed from the upper and/or lower lip. Hair is removed from the entire chin. Hair is removed from the eyebrows, lip, chin, and sideburns. Hair is removed from the top and sides of the bikini region. You will be able to wear bikini bottoms or a full swimsuit without protruding hair. All hair is removed in the bikini region. Two finger widths of hair remains vertically in the center. Hair can be left on the labia or removed. All hair in the bikini region is removed. One finger width of hair remains vertically in the center. Hair can be left on the labia or removed. All hair is removed from the bikini region. A triangular patch of hair remains. Hair can be left on the labia or removed. All hair is removed from the bikini region. No hair is left in the front, on the sides, or inner thighs. All hair is removed from the bikini region, including the back, between the buttocks. A color is chosen and painted on the eyebrows. Developing time is 3-5 minutes. A color is chosen and applied to the eyelashes. Developing time is 8 - 10 minutes. I use all natural vegetable dyes in an array of colors. I can dye the hair darker, but I cannot make it lighter. Color lasts about 1 month. Airbrush tanning, often called spray tanning or sunless tanning, is a process by which a DHA based solution is airbrushed on to the skin via HVLP tanning equipment. The DHA airbrush tanning solution is applied while the client stands in a pop up spray tan tent. 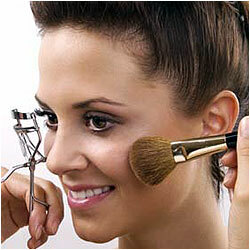 Makeup is applied to the face using either the client’s makeup, or the Aesthetician’s makeup. Makeup is applied to the client’s face using either the client’s makeup, or the Aesthetician’s makeup. 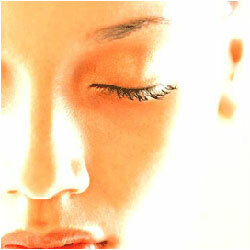 During the process, the Aesthetician will teach you step by step how to apply makeup.